Pyeng Threadgill's musical roots run deep. Daughter of jazz composer Henry Threadgill and choreographer Christina Jones, Pyeng received her BA in music from the prestigious Oberlin College and was awarded the Mellon fellowship to study music in Brazil. Pyeng continued her education at the Institute for Audio Research and is currently working on certification in the Alexander Technique, a teaching method designed to help change habitual tension patterns and increase movement awareness. 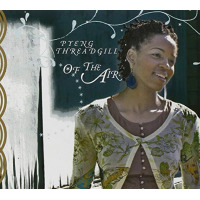 Pyeng, however, is confident that her penchant for simultaneously reaching forward and back will once again achieve her goal to incorporate music of the past with contemporary music: African American traditional standards, spirituals, the avant-garde and her own modern alternative experience in punk, R&B and soul. Ultimately, Pyeng's sound defies categorization. Her voice, perhaps best described as a cross between Jill Scott and Cassandra Wilson by way of Nina Simone (San Diego Union Tribune, 2004) coincidentally invokes her wish to tie together the old with the new. At times, listening feels like a Billie Holiday record, and the next moment you are transported into a smoky New York City hipster joint. Says Threadgill: The famous Jazz singers that we listen to...Ella Fitzgerald, Nancy Wilson, Dinah Washington, Sarah Vaughn, etc. were singing the Pop music of their day. There is something inspiring about that to me. So I study and perform that repertoire while creating for all generations using the influences of my favorite singers and songwriters from Stevie Wonder to Bjork to Bob Marley. “Of The Air,” (the meaning of 'Pyeng', as assigned by her mother) delivers the same risk-taking, soulful, transcendent qualities of Sweet Home. This album promises to satisfy the already converted and win over the rest. Add to this a surprise appearance from esteemed Jazz pianist/composer Myra Melford and the result is once again a daring collage of musical exploration. The entire album was recorded analog, in keeping with Pyeng's interest in maintaining a vintage approach to new material. An artist with a point of view and the chops to bring it life, Pyeng Threadgill is a name that's hard to forget and an artist who produces music for the ages. All About Jazz musician pages are maintained by musicians, publicists and trusted members like you. Interested? 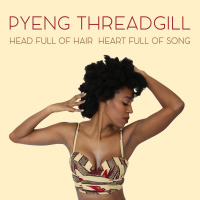 Tell us why you would like to improve the Pyeng Threadgill musician page.